Rolls Royce has recently introduced its latest retractable stabilising fins for ships in motion or at anchor. Rolls Royce has a vast experience in developing marine technology, products and systems for both naval and pleasure yachting use. Products range from propulsive systems, propellers, anti-heeling systems, special engines, gas turbines, hydro-jets and much more. Rolls Royce supplies technology for in motion stability as of the 1960's but with this new model, Rolls Royce enters the stabilisers' market specifically to meet the increasing need of stabilising vessels when at anchor. In actual fact, the new model is an evolved lighter more efficient and simpler version than "Aquarius," initially marketed as of 1999 and delivered to 23 units which are still operative. Naturally, adjustments had to be made to render Aquarius a reliable and efficient stabilising system for ships at anchor. 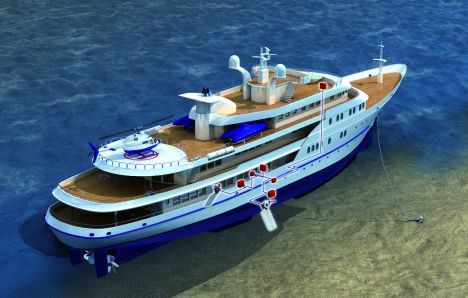 The core of the project is based on the hydro-electrical system which detects hulls' roll causing the hydrofoil shaped fins to rotate at high angles of elevation in order to generate a reactive load efficiently contrasting the sea's motion. When under way, "Aquarius" exploits a vessel's given momentum and speed altering the lift of the stabilising fins. A major change has been carried out to the fins' shape and size which have been lengthened from 3.5 sq. m. to 5.7 sq. m. as well as on the tilt mechanism which can now rotate the fins to as much as 40° against the previous 22.5°. As a result of the above improvements maximum efficiency is ensured in every situation. Rolls Royce's data indicates that roll damping is usually 80% at anchor and between 80% and 90% when cruising, against a previous 30%, with standard stabilisers. The stabilising fins' performance is definitely noteworthy since they are also retractable and relocate into the hull when necessary. 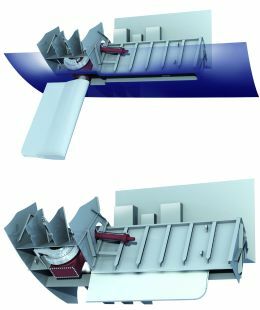 The stabilising fins have originally been designed for large vessels which install two sets of stabilisers as opposed to one set on smaller ships under 95 metres. The system can easily be upgraded from the earlier version by substituting the stabilising fins and increasing the hydraulic control system's capacity. When in 2005 Rolls Royce was completing work on a standard stabilising system for ships at anchor, Oceanco shipyard's request to develop a modern model became a determining factor in the design and development of today's stabilising fin systems. As a result the two companies worked closely together and given the immediate success in the super yacht market, Rolls Royce is already manufacturing a smaller version called "Aquarius 25" with 3.5 sq.m fins as well as "Aquarius 100" equipped with 8 sq.m. stabilising fins.